New to the Lakeland Trails? 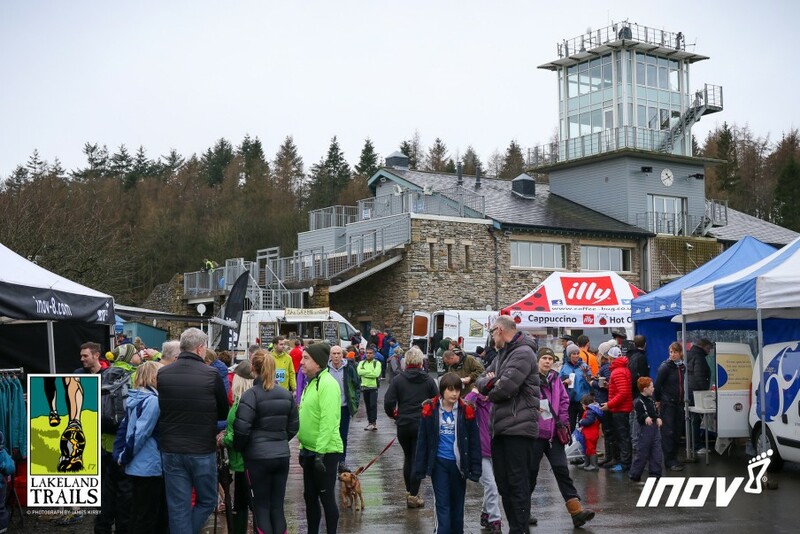 The Lakeland Trails season opener takes place in the pretty village of Cartmel this Saturday. For many, it will be their first trail running event. 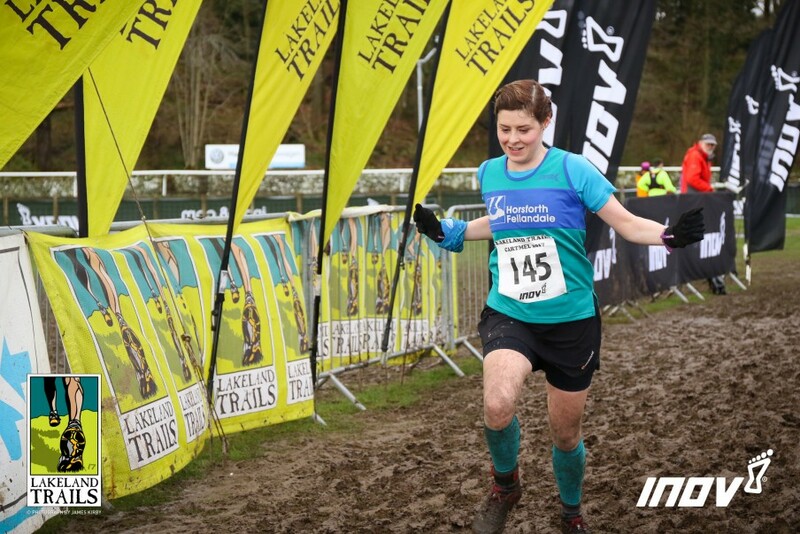 You may have completed other trail runs, yet may be new to the Lakeland Trails in Cartmel. This short piece tells you what to expect on the day. How the Lakeland Trails may be a bit different from what you’re used to. What the courses will be like at Cartmel and how best to run them, that sort of thing. 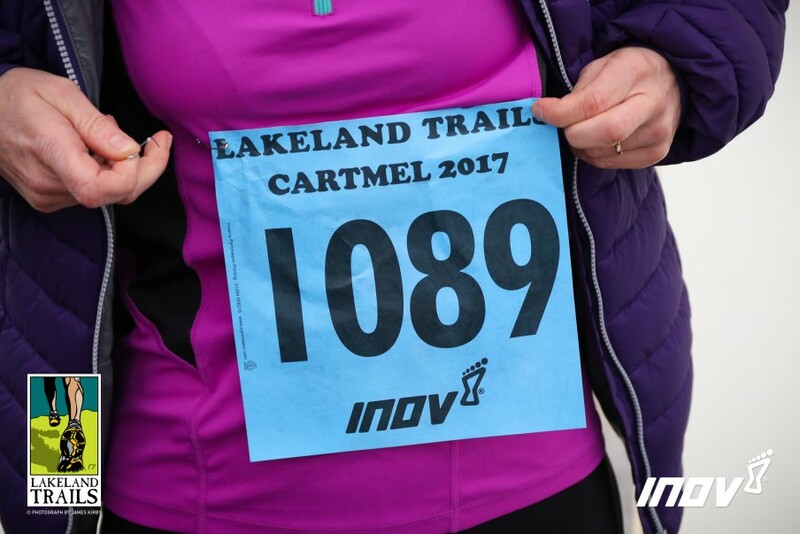 This will be the fifteenth year for the Lakeland Trails – the very first event had just 80 competitors and at Cartmel this year there will be over 1800! 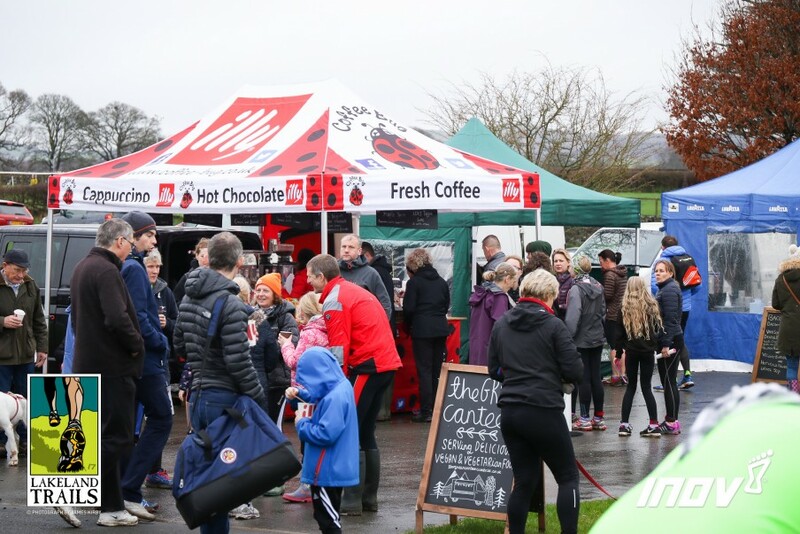 We like to keep the size of the events manageable – big enough to feel a part of something inspiring, small enough to feel like one large sporting family. When you arrive, you’ll be directed by car parking stewards and will see the Cartmel Racecourse main tower building and stands. This is where you’ll find Registration, within the huge marquee. You’ll need to look at the start list boards inside to find your name, then pop along to the Registration team. Tell them your number, and you’ll be given a race number, safety pins, a reusable timing chip and a velcro strap for attaching it to your ankle. All the events during the day have different coloured numbers, so if you’re running in the 10K, your number will be blue. 5K numbers are pink, 18K challenge numbers are yellow and 18K race numbers are white. Once you’ve got your number and timing chip, you can chill out. Lakeland Trails are much more than a trail run. They are a complete family day out, with something for everyone throughout the day. Live music, MC commentary, children’s bouncy castle and face painting. Now is a good time to chat with friends old and new, maybe get a caffeine fix or a late breakfast. 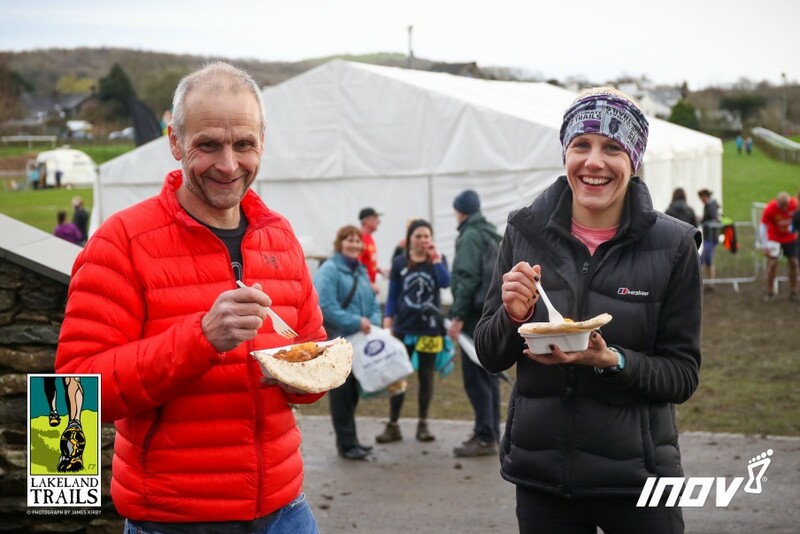 There are plenty of good food and coffee vendors, vegetarian options too, a trail running kit shop, even trail running shoes that you can ‘test run’. Come and say hello to me and other experienced Lakeland Trailers at the blue ‘Meet & Greet’ gazebo. There will be a couple of flying banners to guide you, with Lakeland Trails hoodies, T shirts and headwear to tempt you once you’ve finished. Keep your eye on your watch though – all the events will start on time. If you’re planning on warming up, a slow 15-20 minute jog half an hour before your start time will loosen up your muscles. If you need to leave any spare kit, bring a small bag or backpack. You can then leave it at the baggage store within the marquee, within sight of the start line. Knowing what to wear for your first trail run is very much dependent on your own experience, and the weather. My advice would be to wear something comfortable, clothing and shoes you’re used to. For the 5K you could wear any running shoes, although the more grip, the better. On the 10K and 18K, you’re better off with trail running shoes. Bring along a cagoule, tights, gloves, a hat and small pack to put them in too. The Lake District is a mountainous region, famed for it’s temperamental weather. Even snow can fall here at any time of year! There are maps and profiles of all the courses on notice boards in the marquee. What they don’t tell you is what the underfoot conditions will be like. How best to run them. 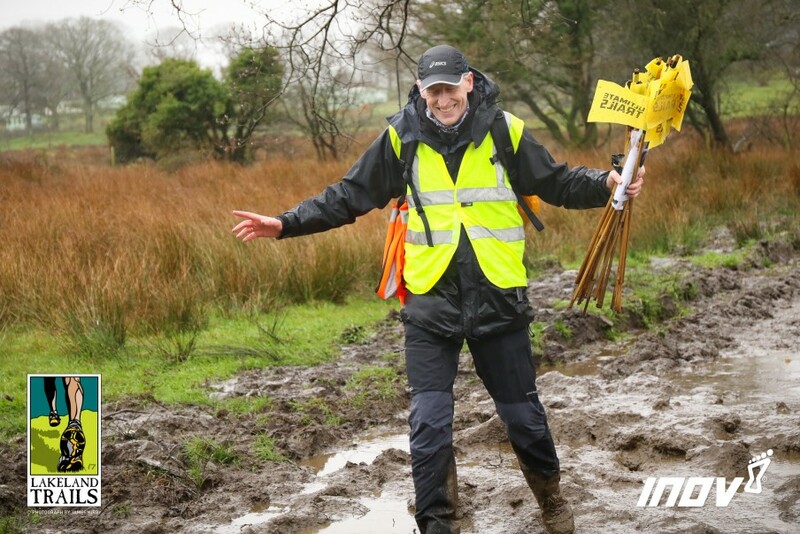 All the courses are very well signed, with flags, race route arrows and lots and lots of friendly marshals. It’s helpful to wear your number on the front, so they know which course to direct you along. The first event, the 10K, sets off at 11am. This is the one that I’m going to run this year. The first kilometre is flat, fast and furious, on a good solid trail, so don’t get carried away. Find your own rhythm. You’re better off starting off slowly and speeding up. It’s good for your morale. Passing people is always better than being overtaken! After 1K, you reach some huge pine trees. Now deep puddles will appear in the track. Enjoy splashing right through them. 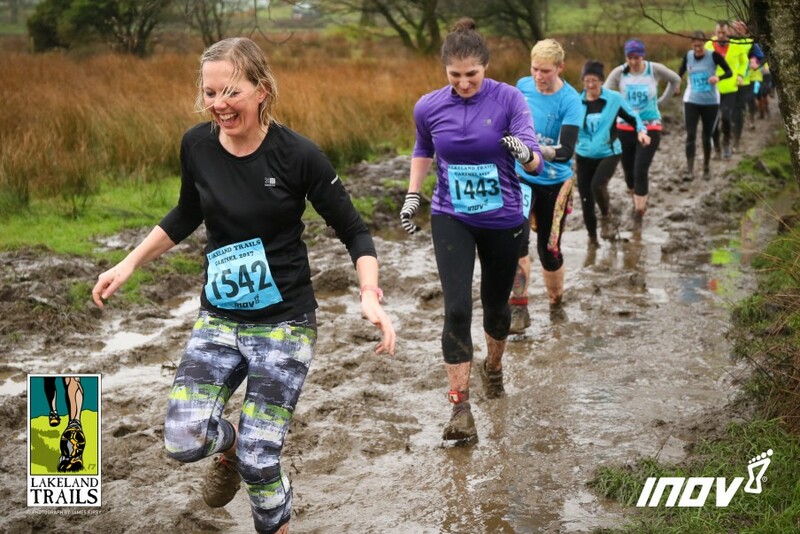 You’re going to get wet and muddy on this course, it’s all part of the fun. After a couple of hundred metres in the woods, the trail starts to wind gradually uphill. This is where your patience at the start will pay off. The faster starters will have legs quickly turning to jelly. The climb goes onto a single track tarmac lane with great views to Morecambe Bay as it levels out. Pat yourself on the back as you’ve done most of the climbing on the course. A level section on hard trail*, then into the first section of mud with hedges either side. Try and keep your momentum and plough through the mire. Some will be trying to avoid the wetter sections, picking their way around. Pass them and splash them! Soon you’re out onto rolling green grassy trails**, past a small caravan park and some pretty Lakeland cottages. A slight downhill and you’ll see what looks like a man eating marsh up ahead. It’s a favoured spot too for one of the event photographers. Whatever you do, don’t try and go around this one. It’s an old sunken track. The water may be brown and knee deep, yet underneath is hard gravel. Plough through the middle as though you were ten years old with a big smile on your face. It’s what life’s about! The edges of this track are where the trouble lies. This is where the deep, sticky mud lies in waiting. Once through the mire, it’s good running along a short section of tarmac lane*** to the water station. From here, some soggy, boggy trails which are just hard work. Relentless going. Once you hit a slight incline, the worst is behind you. Wordsworth daffodils will be watching you from the banks of the trail. Through a farmyard****, then across a small stream, another favourite photography spot. Make a splash. You’ll have a photo memento you can treasure in the future! The hardest section is at the end, the last one and a half kilometres or so. There’s a climb in the woods, and it’s soft underfoot. The trail winds through the trees and you’ll probably hear the PA and band, tantalisingly close. Yet the end seems to elude you. Suddenly you burst out of the trees and you have a final couple of hundred metres of glory. With luck, your name will be announced as you cross the line. Moving along at a walk, you’ll be ushered into a section of the marquee to have your timing chip taken from you. Then awarded your well-earned finisher’s T shirt that you can wear with pride. Now you can change out of your muddy, sweaty gear. Treat yourself to some goodies. Chat with your new friends and enjoy the atmosphere. The second event, the 5K, sets off at 11.15am. There are a lot of youngsters taking part in this event and they haven’t learnt the art of pace judgement yet. They will set a suicidal pace. Keep up with them at your peril!. You follow exactly the same route as the 10K course as far as the level section of hard trail*, after around 3km. From here, you take a ‘short cut’ along a forest road, gently downhill to the farmyard described above****. You have the stream to cross and the hard section back through the woods, so save some energy for yourself. Bringing the family along? Children under the age of 12 can take part in the Fun Trails. Short, exciting trails for the Under 10’s and Under 12’s. Any age can take part, even mums and dads can run with the children too. They will set off when everyone is back from the 10K and 5K events, the younger children setting off first. Gerry the Giraffe joins them and keeps them on course. Everyone gets a medal for taking part. The buzz and excitement of the kids is worth experiencing first hand. The third senior event, the 18K Challenge, sets off at 1pm. It follows exactly the same route as the 18K Race an hour later. The Challenge is the relaxed version of the 18K event. The one for taking part and enjoying the views and friendly banter along the trail. Both 18K courses follow the 10K route as far as the rolling green grassy trails**, so you can read as far as this in the 10K route to know what’s in store for you. Then a stunning 8K extra loop first takes you along good, fast grassy trails with views in all directions. Lakeland snow capped peaks ahead of you in the distance, the shining levels of Morecambe Bay over to your left. After crossing a single track lane, there’s a short climb through mature oak woodland, then comes the gorgeous Bigland Tarn. You skirt round this and along a track to the first water station at around the 9K mark. More tarns to circumnavigate, along a lovely, muddy single track cutting through heather. It’s difficult to overtake here, much better to wait, take it easy and a few hundred metres later the trail opens up and there’s lots of room to pass. A section of rolling single track tarmac lane, then into rough felled woodland, the trails cut up from heavy machinery. This section of the course tends to be the toughest. 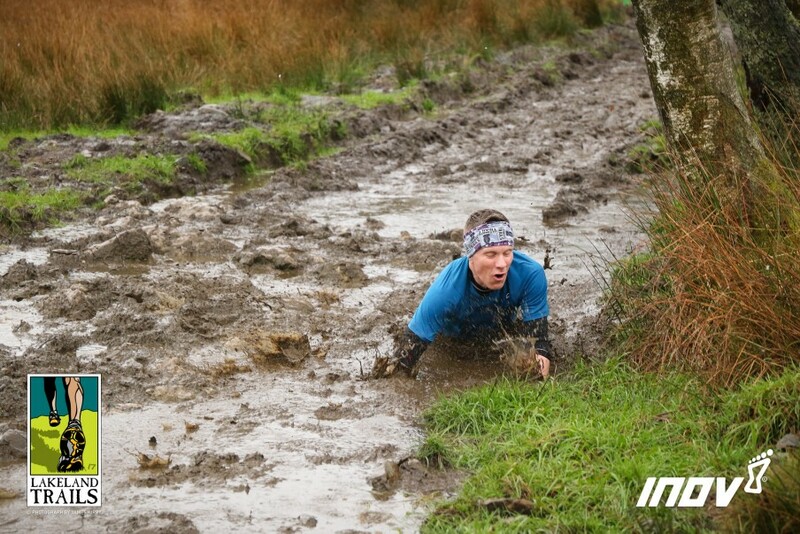 It’s wet, muddy and there’s a devilish incline. One of those that’s not steep enough for everyone to walk, yet very tough to run. You’ll be soon through this and onto another short section of tarmac lane***, picking up the 10K route from here, all the way back to the finish. The fastest in the 18K Race, which set off at 2pm with white numbers, are GB International athletes who will be home within 70 minutes. This leads to an exciting finish as everyone arrives back from both 18K courses at similar times. By 3.30pm, singer/songwriter Pete Lashley, who would have already run in the 18K Challenge, takes to the stage. Pete plays for an hour, many of the songs he’s written himself, as well as requested cover songs. Then it’s the Prize Giving for all those who have earned them, followed straight afterwards by the Spot Prize draw. Anyone can win one of the spot prizes, although you will need to fill out a spot prize form and put your name and number on it, then just post it in the podium. By 5pm everything is over for another day. If you’re staying in the Lake District, you’ll meet lots of Lakeland Trailers in the pubs and restaurants, proudly wearing their finisher’s T shirt. Welcome to the Lakeland Trails family. If you’ve got any questions, please leave them in the comments below and I’ll do my best to answer them. 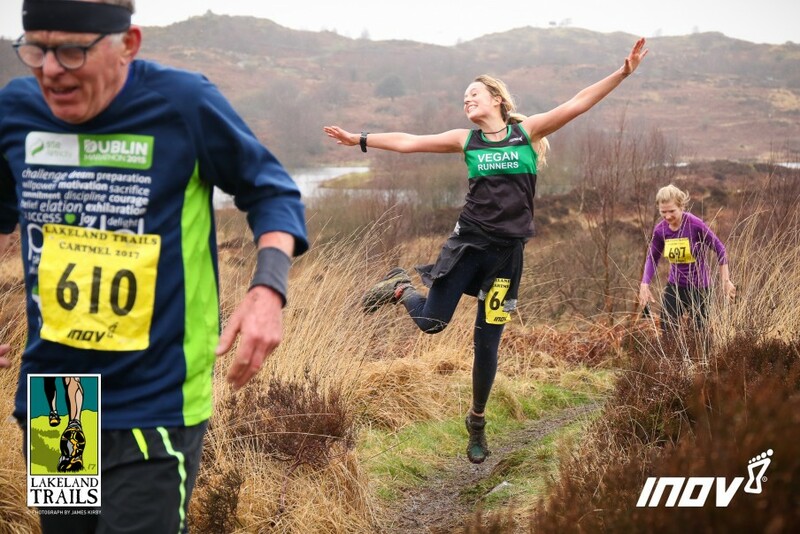 This entry was posted in Best Of, Blog and tagged Cartmel, Cartmel Racecourse, Cartmel Trail, Lake District, Lakeland Trails, run, running, trail, trail running, trails. Bookmark the permalink. I think I may have entered the wrong 18k race. I think it will take me around 2 hours 20 to run. Should I have entered the challenge not the race. Having a slight panic attack! I run with wirral Vikings of the wedding fame but the worst runner if the club butva tryer thanks.